, D. D. an eminent dissenting divine, and the most able and learned baptist writer of the last century, was born at Kettering in Northamptonshire, Nov. 23, 1697, of parents in humble life. His father was a deacon of the baptist meeting at Kettering; and having, from various causes, some of which appear rather imaginary, a strong impression on his mind that this son would become a preacher, and an eminent character, exerted his utmost to give him a suitable education. His first attempts were crowned with such success as to confirm his father’s hopes. 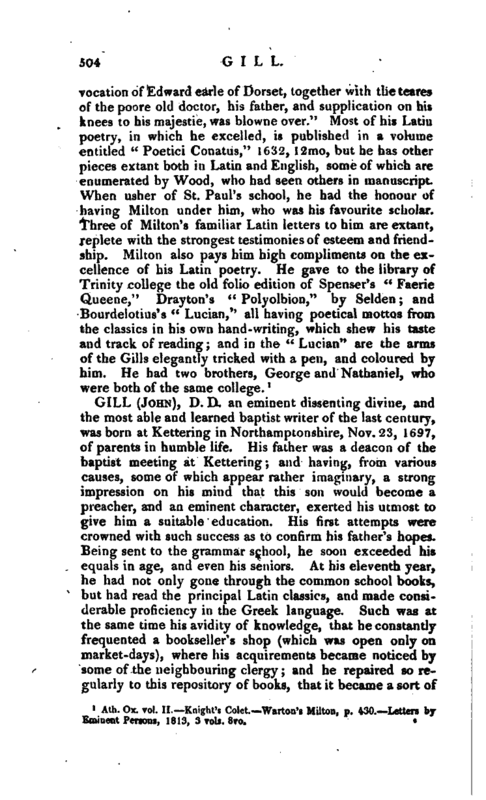 Being sent to the grammar school, he soon exceeded his equals in age, and even his seniors. At his eleventh year, he had not only gone through the common school books, but had read the principal Latin classics, and made considerable proficiency in the Greek language. Such was at the same time his avidity of knowledge, that he constantly frequented a bookseller’s shop (which was open only on market-days), where his acquirements became noticed by some c.f the neighbouring clergy; and he repaired so regularly to this repository of books, that it became a sort of | asseveration, “such a thing is as sure as John Gill is in the bookseller’s shop.” Unfortunately, however, his progress at school was interrupted by an edict of the master, requiring that all his scholars, without exception, should attend prayers at the church on week-days. This, of course, amounted to an expulsion of the children of dissenters, and of young Gill among the rest. His parents not being able to send him to a distant school, some efforts were made to get him upon one of the dissenting funds of London, that he might be sent to one of their seminaries. 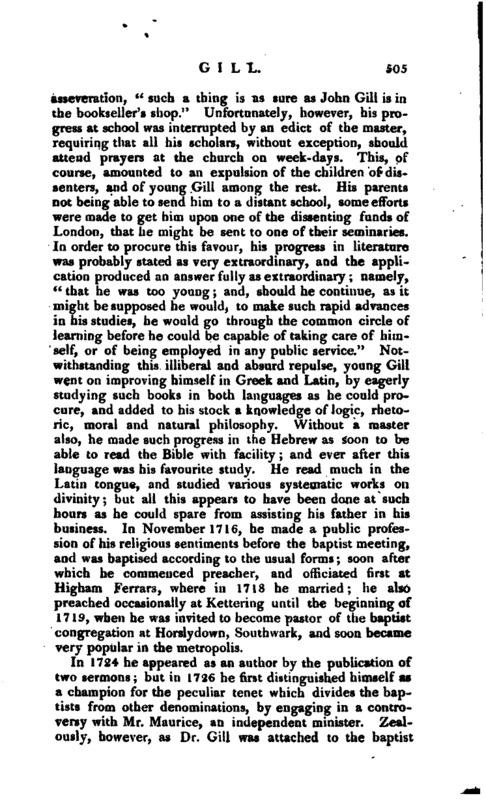 In order to procure this favour, his progress in literature was probably stated as very extraordinary, and the application produced an answer fully as extraordinary namely, “that he was too young and, should he continue, as it might be supposed he would, to make such rapid advances in his studies, he would go through the common circle of learning before he could be capable of taking care of himself, or of being employed in any public service.” Notwithstanding this illiberal and absurd repulse, young Gill went on improving himself in Greek and Latin, by eagerly studying such books in both languages as he could procure, and added to his stock a knowledge of logic, rhetoric, moral and natural philosophy. Without a master also, he made such progress in the Hebrew as soon to be able to read the Bible with facility; and ever after this language was his favourite study. He read much in the Latin tongue, and studied various systematic works Oh divinity; but all this appears to have been done at such hours as he could spare from assisting his father in his business. In November 1716, he made a public profession of his religious sentiments before the baptist meeting, and was baptised according to the usual forms; soon after which he commenced preacher, and officiated first at Higham Ferrars, where in 1718 he married; he also preached occasionally at Kettering until the beginning of 1719, when he was invited to become pastor of the baptist congregation at Horslydovrn, Southwark, and soon became very popular in the metropolis. In 1724 he appeared as an author by the publication of two sermons; but in 1726 he first distinguished himself as a champion for the peculiar tenet which divides the baptists from other denominations, by engaging in a controversy with Mr. Maurice, an independent minister. Zealously, however, as Dr. Gill was attached to the baptist | tenets, and frequently as he wrote in favour of them, it was for the most part in his own defence. “Intimate witli him as I was,” says Mr. Toplady, “I never so much as once ueard him drop a single hint, in all our conversations, directly or indirectly, concerning the article of baptism.” In 1728 he published his “Exposition of the Song of Solomon,” folio. The year before it appeared, Whiston had published a pamphlet in which he endeavoured to prove that the Song of Solomon was a spurious book, and not fit to stand in the canon of scripture. To all this Gill answered with great ability. 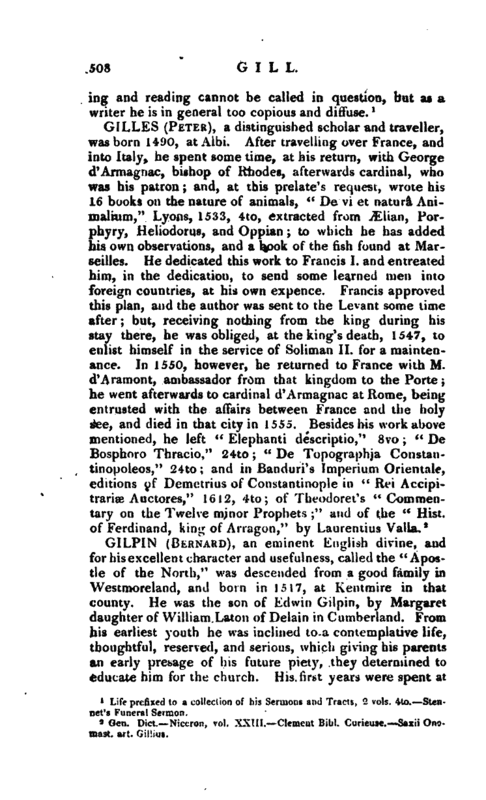 It does not appear whether Whiston had seen this answer, but he himself informs us that in 17 J-& he had heard a great character of Dr. Gill for his skill in the Oriental languages, and had a mind to hear him preach, but being informed that he had written a folio book, on the Canticles, he declined to go and hear him; a proof that Whiston’s dislike to bigotry was to the bigotry of others only. In 1751 a new edition of the "Exposition*' was published in 4 to, with corrections and additions, and a third, likewise: with additions, in 1767. 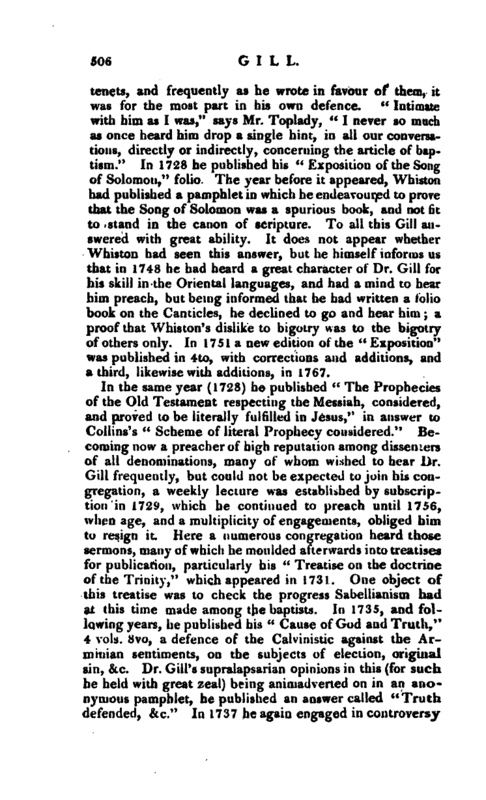 In the same year (1728) he published “The Prophecies of the Old Testament respecting the Messiah, considered, and proved to be literally fulfilled in Jesus,” in answer to Collins’ s “Scheme of literal Prophecy considered.” Becoming now a preacher of high reputation among dissenters of all denominations, many of whom wished to hear Dr. Gill frequently, but could not be expected to join his congregation, a weekly lecture was established by subscription in 1729, which he continued to preach until 1756, when age, and a multiplicity of engagements, obliged him to resign it. Here a numerous congregation heard those sermons, many of which he moulded afterwards into treatises for publication, particularly his “Treatise on the doctrine of the Trinity,” which appeared in 1731. One object of this treatise was to check the progress Sabellianism had at this time made among the baptists. In 1735, and following years, he published his “Cause of God and Truth,” 4 vols. 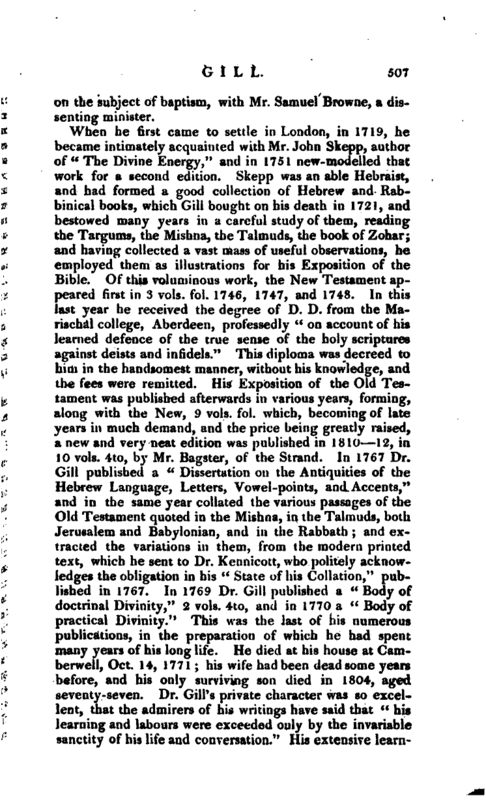 8vo, a defence of the Calvinistic against the Arminian sentiments, on the subjects of election, original sin, &c. Dr. Gill’s supralapsarian opinions in this (for such he held with great zeal) being animadverted on in an anonymous pamphlet, he published an answer called “Truth defended, c.” In 1737 he again engaged in controversy | on the subject of baptism, with Mr. Samuel Browne, a dissenting minister. Life prefixed to a collection of his Sermons and Tracts, 2 vols. 4to.—Stennet’s Funeral Sermon.